It’s that time of year again when families are looking for easy meal ideas that are delicious and don’t take a long time to prepare. Right??!! 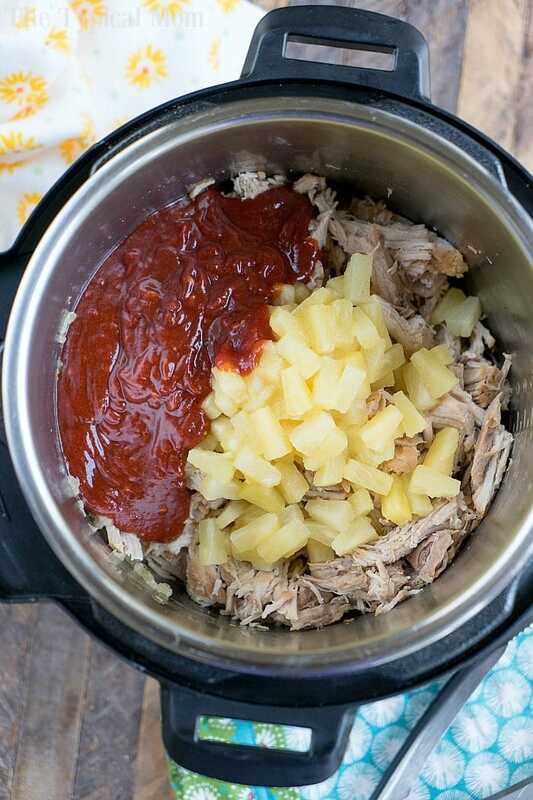 If you have kids at home and are busy getting them ready for Back to School this easy Instant Pot Hawaiian pulled pork recipe is perfect! It’s one of our favorite 101+ Instant Pot recipes. 😉 Sponsored post written by me on behalf of Smithfield® Prime Fresh Pork. The opinions and text are all mine. I’m always trying to create easy recipes that are great during the summertime. Especially during outdoor parties, picnics, and family dinners when school starts. 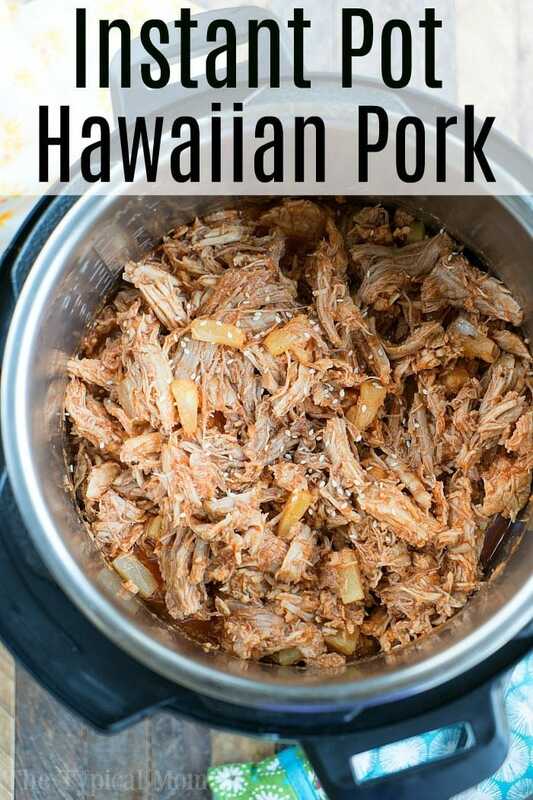 That’s where this Instant Pot Hawaiian pulled pork comes into play. Something I can whip together and throw in my Instant Pot is ideal especially on days where I don’t have a lot of time. But at the same time I want something hearty that will keep our bellies full. Why do I use my Instant Pot as often as I do? Well during the summertime I do NOT want to turn on my oven when it’s 90ish degrees outside. During the busy school year it’s great too because we are BUSY! 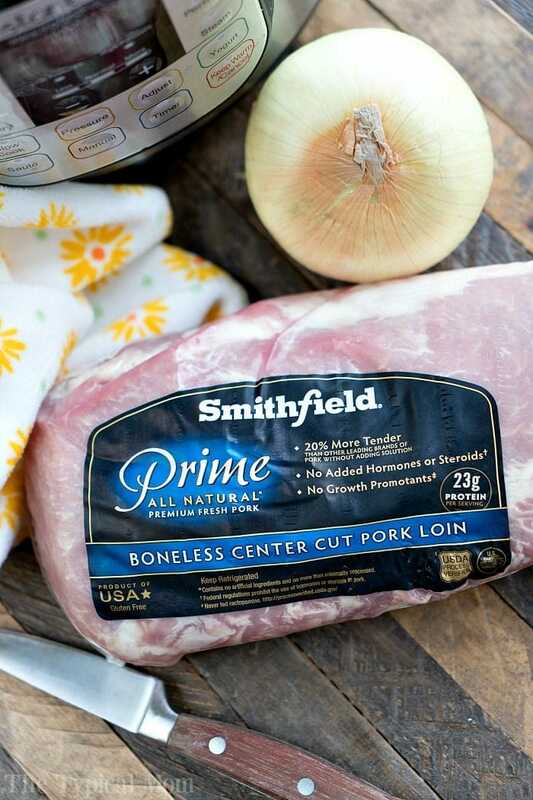 To start with all you need are a few items that can be found at your local Stokes Fresh Food Market including this Smithfield® PRIME Boneless Center Cut Pork Loin; it’s great for making pulled pork! You see….not all pork is created equal. With Smithfield Prime Fresh Pork cuts you’ll get a piece of meat that is 20% more tender, there are no added hormones or steroids. It’s also a product of the USA, and is gluten free. You could use their pork tenderloin for this but I wanted a larger cut of meat. The center cut pork loin is what I chose to use this time. Ours was about 3.5 lbs. in size and feed all 5 of us. Then add some olive oil to your Instant Pot (I am using a 6 qt. Instant Pot here) and set it to the saute function. Lightly sear all sides of your pork and remove when done, do this for all 4 pieces. Put your seared pork pieces back into your pot with your diced onions and vegetable broth. Close your lid and steam valve. Set your Instant Pot or other version of pressure cooker to pressure high for 60 minutes. When your pot beeps do a quick release and smell the wonder already…and it’s not even done yet! Shred your OH SO TENDER pork with two forks (I usually do this in a separate bowl). Drain your pot into a strainer keeping the tender onions, return those to your Instant Pot. Mix ingredients for your Hawaiian sauce. Put your shredded pork back into your pot with pineapple tidbits and the sauce you just made. Gently mix together and put lid back on. 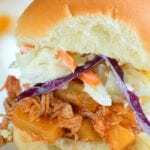 Serve your Instant Pot Hawaiian pulled pork on top of rice or sweet rolls topped with Hawaiian cole slaw and enjoy!! I made these Instant Pot pulled pork sliders using this recipe the other night and my kids raved over them! This is what it looked like when it was done!! Smothered in a tangy but sweet Hawaiian barbecue style sauce, this pulled pork is great no matter how you serve it. 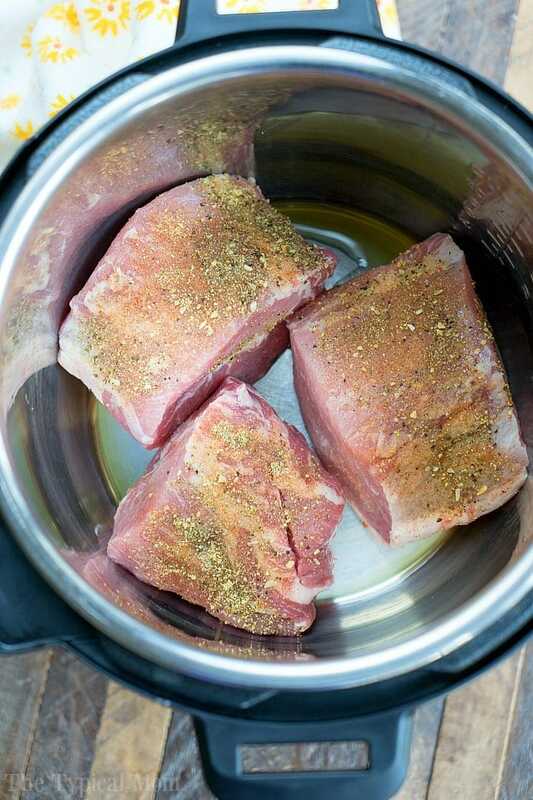 The pork keeps well for hours in your Instant Pot and is awesome if you’re having a party and want to keep it for grazing throughout the afternoon. If you want to warm it back up just set your Instant Pot to sauté and use tongs to gently move around until it’s all warmed again and then turn off again. Leaving the top on will keep it nice and warm too. Smithfield Prime Boneless Center Cut Pork Loin – about 3.5 lbs. Leave broth in pot and put your 4 pork pieces back in. Pour remaining cup of broth into your pot with your diced onions. Close lid and steam valve and set to pressure high for 60 minutes. Do a quick release when done. Turn pot OFF/Cancel. Take 1 piece out at a time and in a separate bowl shred your pork and remove fat (if desired). Dump contents of pot out into a strainer to keep the cooked onions. Put onions back into your pressure cooker pot. Add shredded pork back into your pot with your onions. Mix together all other ingredients listed above (from ketchup down) well in a bowl (except pineapple tidbits) and pour on your pulled pork inside your pressure cooker. Gently mix so pork is coated. Add in your pineapple tidbits and gently mix in. Serve on slider buns topped with our homemade cole slaw or if you want it a bit warmer set to saute low again, stir gently as it is warming and then turn pot off and serve. For more Smithfield meal ideas visit their site and let us know which one is your favorite!! Ok I have read the comments about getting the BURN notice and that is what we keep getting! We followed the recipe exactly and you mentioned something about deglazing after sauteeing? But the recipe does not ever say to sautee! Help! Yes, in step 2 it directs you to use saute function. Then in step 3 it states you must deglaze your pot, tells you how, and there is a link in the steps above within the post showing you how to do this if you are unsure how. In that post there is even a video showing you how. If you saute any meats in an Instant Pot this is a step you must do to ensure it doesn’t trigger the burn notice. Turning your pot off during that step is a must as well, as stated, to give you pot time to cool down or it will falsely trigger that message as well. If you haven’t done either then I would imagine your burn notice is on and all you can do is turn it off, let it cool down, remove meat, deglaze now as stated, and then set to designated time again. Help, I thought I had brown sugar for this recipe but I don’t! Can I substitute it with something? Hmmmmm it won’t have the same flavor but for sweetness you could add a bit of corn syrup or a bit of white sugar??? I have a bone in pork loin, can I use this instead? You could but I’d try to cut it off the bone and into larger chunks without it or timing will be off and it won’t be as tender. 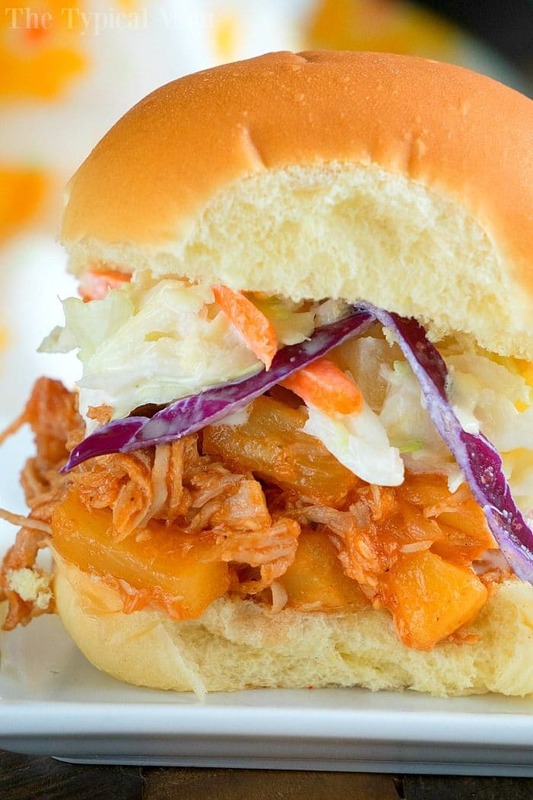 We love trying new pulled pork recipes and this one is such a winner! Love the pineapple flavor! Can I substitute the brown sugar with something?! I love this pulled pork recipe – haven’t tried pulled pork in the instant pot yet but now I have a good place to start!